With all the news about school shootings and suicides it is more important than ever to have a program like the UF Health PALS THRIVE program in our schools. PALS THRIVE is a program that has been around for nearly 18 years, but gets little press. The program has grown through the years as many programs do. It started out with two young teens after the Columbine shootings in 1999. They desperately wanted to be sure that nothing like this ever happened in their school. Their idea of “No One Sits Alone” is how the program began, a simple message to reach out to those who may appear to need a friend, and be that friend to them. Once these teens reached out to their school and UF Health, the program began morphing into what it is today; a program that has now seen 40,000 students in 8 different schools providing free mental health counseling, guidance and leadership. 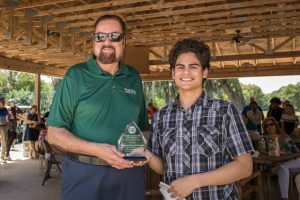 This program has changed the lives of many teens; we heard from one such teen at our 2018 PALS THRIVE and Alive Golf Tournament that took place on May 3rd. Orlando Merced-O’Neill spoke to an audience of approximately 80 people about how PALS THRIVE helped him to navigate through the difficult waters of middle school, and helped him learn to cope with the things he was dealing with in a positive way. 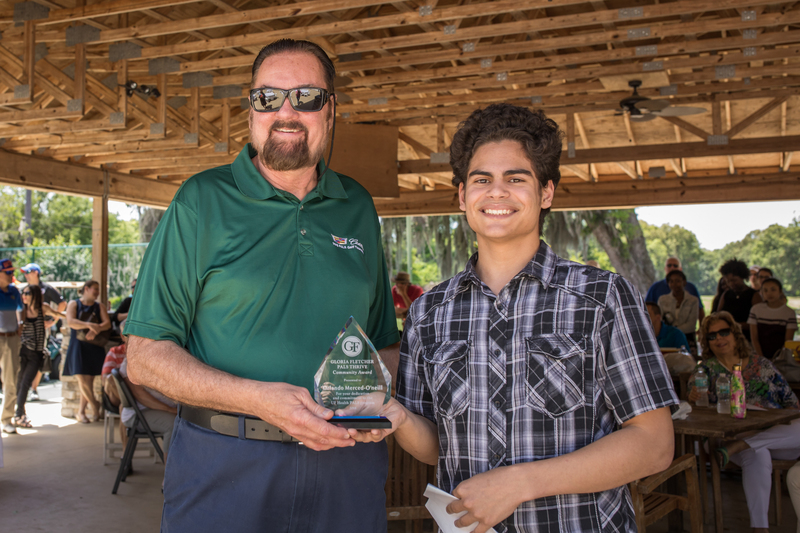 He went from being a quiet, overwhelmed kid, to a leader at his high school; where he is now part of a program that meets outside of the school to learn leadership skills, plan events for PALS THRIVE and to continue the mission of “No One Sits Alone.” At the PALS THRIVE and Alive Golf Tournament, Orlando was awarded the Gloria Fletcher Award for the successes he has made in the PALS THRIVE program. This award began when Gloria Fletcher, a local attorney and huge supporter of the PALS THRIVE Program passed away. As an honor to her, the Gloria Fletcher Award was born. The award is given out twice a year; once for a student who has shown leadership skills within the PALS Program, and once to an adult who has been instrumental in furthering the programs values. Orlando is a model of what the PALS THRIVE program is all about, helping kids through their toughest times, so they can be better citizens in the future. If you think this program is just another program asking for money that never really accomplishes much, I am here to tell you that is not true! PALS THRIVE has mentored over 40,000 students in the last 18 years. These kids are seen by advanced graduate students in psychology and counseling, supervised by licensed professionals, to provide free mental health services, leadership and prevention programs in local schools. We know that PALS THRIVE has prevented teen suicides, and even a potential school shooting, yet most people don’t even know this program exists! Each year, kids in the program are surveyed at the beginning and end of the year. The large majority of them not only say they would recommend the program, but say that it has helped them get through some very rocky situations. Currently, PALS THRIVE counselors are at their max capacity; they are stretched to the limit, because yes, there are that many kids that need help! We have other schools in the area begging for this program in their schools, but we don’t have the funds needed to expand the program any further. It takes approx. $25,000 per school each year to continue the program, which is supported through private donations. PALS THRIVE is currently in 8 schools, which means we need about $200,000 each year to continue in the schools we are already in. This program is one that should be modeled all over the country, yet gets very little press or support in our area. Believe it or not, this year has been the hardest one to date to get sponsors to support the program. Even with the Parkland shootings just a few hours south of Gainesville, we are having a hard time getting sponsors. We want to publicly thank the sponsors that helped us with the golf tournament this year, and beg others to consider helping next year or with our upcoming “Dancing Through the Decades” event that will also support the program. For more information about PALS THRIVE, CLICK HERE. Donations can also be made on this site. With much gratitude, we thank the following sponsors of the PALS THRIVE and Alive Golf Tournament. Food Sponsors: Pomodoro Cafe, Zaxby’s , Dominoes, and Burkhardt Sales and Service. Hole Sponsors: Law Office of Brian Kocsis,Brian Scarborough of Hub International, Tate Mikell, Realtor; The Veterinary Center at Hunters Crossing, Heather Doughton, Realtor; Mitchell Martin of Globe Home Protection, Mel Clark and Carol Bosshardt, Reddish and White CPA, Bernie and Lucy Marrero, Charity Golf International, Southeast Car Agency, Morgan and Morgan, Marc Spiwak of Nations Lending, Mike Jones of Ameris Bank Mortgage Services, Gainesville Gynecology Group, Bosshardt Title Insurance, The Law Office of Moulton Bosshardt, and PRIME Mortgage Group. Friends of PALS Sponsors:Matt Peck of Housemasters, Brian Scarborough of Hub International, 43rd Street Deli, Millhopper Family Dentistry, and Scruggs and Carmichael.